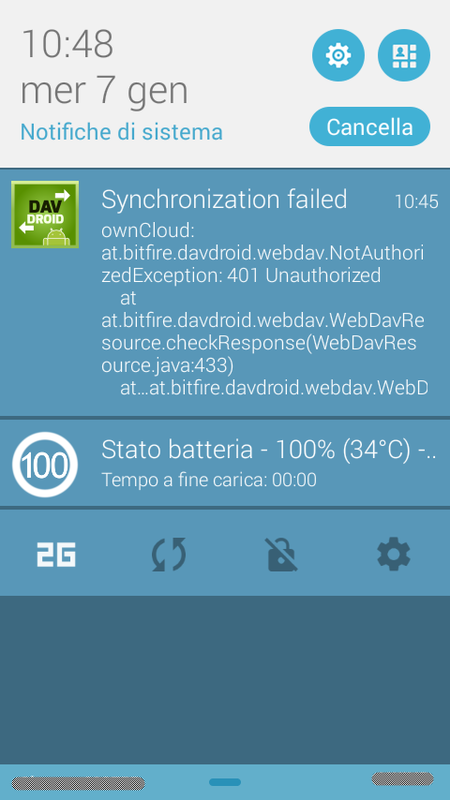 Since 0.6.10.x (F-Droid) if I edit a contact I am no longer able to sync, with error 401 unauthorized. Downgrading to 0.6.8 solve this. Is there a reason why you think this is a client problem? 401 means Unauthorized, i.e. wrong user name/password. Maybe the password has changed? @devvv4ever thank you, maybe I will try this weekend, I don’t have much time right now. @shiba89 I don’t understand the argument. You may also have changed the password on your private server. But yes, logs and steps to reproduce would be helpful if you think this is a problem of DAVdroid (which could of course be the case, I just have no reasons to think so yet). I found the reason why this happens watching the logs with adb. It seems that owncloud appends @server.hostname.com to every vCard UID field. Since I have had this contact list for several years, some vCard had the hostname of my previous server. Davdroid <0.6.10 apparently ignores this field, so that’s why I never noticed the problem until now. However since 0.6.10 it tries to sync a modified contact to the server pointed by its UID. Removing every UID solved the problem.